The act or process of using certain data to predict future market movements. Various methods exist for forecasting; experts differ on which ones, if any, work. See also: Technical analysis, Fundamental analysis, Random walk theory. see SALES FORECASTING, TECHNOLOGICAL FORECASTING. Fig. 75 Forecasting. 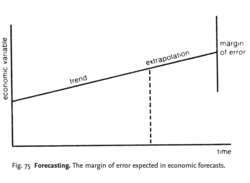 The margin of error expected in economic forecasts. survey techniques, involving the use of interviews or mailed questionnaires asking consumers or industrial buyers about their future (buying) intentions. Alternatively, members of the sales force may provide estimates of future market sales, or industry experts can offer scenario-type forecasts about future market developments. experimental methods, providing demand forecasts for new products, etc., based on either the buying responses of small samples of panel consumers or large samples in test markets. EXTRAPOLATION methods, employing TIME-SERIES ANALYSIS, using past economic data to predict future economic trends. These methods implicitly assume that the historical relationships that have held in the past will continue to hold in the future, without examining causal relationships between the variables involved. Time-series data usually comprise: a long-run secular trend, with certain medium-term cyclical fluctuations; and short-term seasonal variations, affected by irregular, random influences. Techniques such as moving averages or exponential smoothing can be used to analyse and project such time series, though they are generally unable to predict sharp upturns or downturns in economic variables. Barometric forecasts to predict the future value of economic variables from the present values of particular statistical indicators which have a consistent relationship with these economic variables. Such LEADING INDICATORS as business capital investment plans and new house-building starts can be used as a barometer for forecasting values like economic activity levels or product demand, and they can be useful for predicting sharp changes in these values. then use past data to estimate the regression coefficients d, b and c (see REGRESSION ANALYSIS). Econometric models may consist of just one equation like this, but often in complex economic situations the independent variables in one equation are themselves influenced by other variables, so that many equations may be necessary to represent all the causal relationships involved. For example, the macroeconomic forecasting model used by the British Treasury to predict future economic activity levels has over 600 equations. No forecasting method will generate completely accurate predictions, so when making any forecast we must allow for a margin of error in that forecast. In the situation illustrated in Fig. 75, we cannot make a precise estimate of the future value of an economic variable; rather, we must allow that there is a range of possible future outcomes centred on the forecast value, showing a range of values with their associated probability distribution. Consequently, forecasters need to exercise judgement in predicting future economic conditions, both in choosing which forecasting methods to use and in combining information from different forecasts. Parkinson is the author of Cash Flow Forecasting Templates, available on CDROM at www. Leetmaa has higher hopes for long-range forecasting. Models should eventually be able to pick up these subtle forecasting hints from the ocean at any time of year. As the ultimate consumers of business forecasts, the financial executives greatly influence the standards of forecasting in terms of the reports expected and the content and process required. Demanding "the number" spawns bad forecasting habits that are hard to break, but by insisting on quantified uncertainty and transparent reasoning, financial executives can make a spectacular difference in the company's ability to prepare for the future and harness uncertainty for competitive advantage. The butterfly effect places a real limit on the accuracy of weather forecasting models. The Pareto Analysis in SYSPRO Forecasting makes this task less daunting by providing insight into the "most important" items on which attention should be focused. Terra Technology is the leading provider of Real-Time Forecasting and Inventory solutions for consumer goods companies. reports that its forecasting and planning team is now up and running on the Atlas Planning Suite's Demand Management Engine module for sales analysis and forecasting of products manufactured in the Company's El Salvador plant. This forecasting technology achieved industry-leading accuracy in the 2004 and 2005 hurricane seasons. NASDAQ: MANH), announced the availability of the stand-alone Demand Forecasting component of its Integrated Planning Solutions(TM). Epidemiology-based forecasting is a transparent and rigorous approach to projecting the sales implications of critical events and overall market evolution.